Dr. Jaen's special interests include improving preventive care for individuals of all ages, preventing complications from chronic diseases like diabetes, high blood pressure and heart disease. He is passionate about building and studying high-performance primary care offices. He has been selected to the Best Doctors in America yearly since 2002. He is dedicated to building a healthier San Antonio through efforts in community wellness. 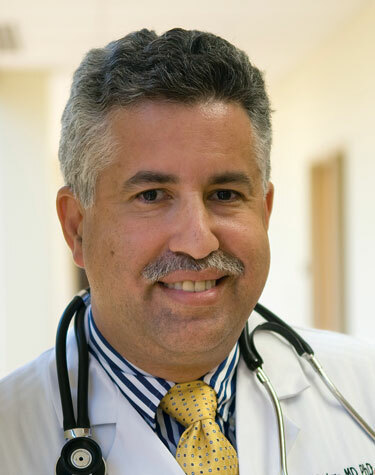 Dr. Jaen was elected member of the National Academy of Medicine (formerly known as the Institute of Medicine) of the National Academies in 2013. He was also co-director of the American Academy of Family Physicians (AAFP) Center for Research in Family Medicine and Primary Care. Over 20 years, the Center studied almost 500 mostly independent, community-based primary care practices and completed the evaluation of the AAFPs national demonstration project of the patient-centered medical home. He served on the panels that published the U.S. Public Health Service smoking cessation guidelines in 1996 & 2000 and was co-chair of the panel that published an update in May 2008. In 2005, he was appointed to the National Advisory Council to the Agency for Healthcare Research and Quality (AHRQ). He received a Generalist Physician Faculty Scholar Award from the Robert Wood Johnson Foundation and a Cancer Control Career Development Award for Primary Care Physicians from the American Cancer Society.